Are you looking for a reliable leather harness for your dog? Have a look at these professional dog training supplies! They are training and walking, of specific use or multifunctional ones. A wide range of various types of dog harnesses won’t leave you indifferent. Each leather dog harness impresses with its unique design, elaborate pattern and fashion studs. 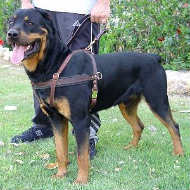 Training dog harness is of increased durability and strength. Walking dog harness is attractive whether it is studded or not. Elegance, safety and comfort are the main priorities when manufacturing FDT leather harnesses. Make your dog’s outfit really distinguished, choose one of these harnesses for dogs! 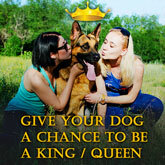 Dog Harness reviews will help you to make the correct choice. Enjoy online shopping. Purchase this Padded Leather Dog Harness for safe training and walking of your pet! Appreciate its premium quality and handcrafted design. Let your dog enjoy wearing this Professional Leather Dog Harness for Pulling/Tracking. It is front padded to avoid any discomfort during pet's activities. Buy Walking Leather Dog Harness which perfectly suits for tracking and training. Comfy y-shaped design makes wearing pleasant and joyful. Buy this Leather Dog Harness for professional agitation dog training and comfortable walking. The harness is softly padded and provides high level of protection. Purchase now this Leather Dog Tracking Harness. Walking dog with harness on will be safe, reliable and stylish. Get this Attack Dog Harness which is also great for agitation and protection dog training. It is specially built for heavy-duty activities. Equip your dog with this Leather Dog Harness for Walking, Tracking and Pulling. Front padded leather strap provides softness and gentle touch. Buy this Brass Spiked Dog Harness now! This designer dog harness perfectly suits for daily Walking and Training. Pamper your puppy with this Designer Leather Dog Harness for walking and training! Adjustable straps will help you ti fit the harness on your pet comfortably. Get this Attack Dog Harness with handpainted flames on the chest. This dog training harness is comfy and reliable. Purchase this White Guide Assistance Leather Dog Harness for walking! The harness is reliable with control handle. Check this Guide Assistance Leather Dog Harness for extreme comfort! It comes with long handle and reflective straps. Choose this Dog Tracking Harness for efficient use! This lightweight dog harness has non-restrictive design and is comfy to wear. Buy now this Stylish Dog Harness handpainted with barbed wire pattern! Make training and walking of your pet safe and fashionable. Protect your dog and buy him this Attack Dog Harness with softly padded chest plate. Your dog will receive comfort and safety while wearing. Obtain this Stylish Leather Harness for Small Dogs and Puppies! Softly padded on chest, it delivers incredible comfort to the canine. 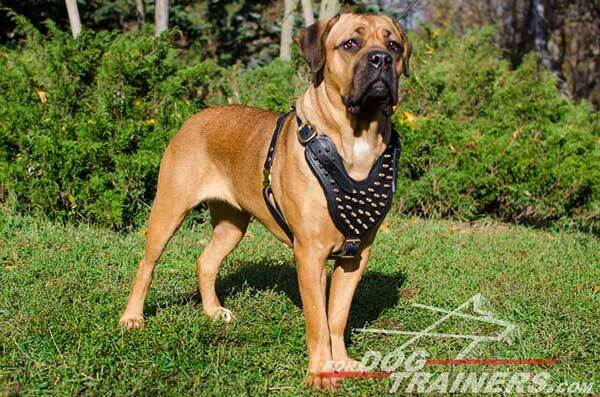 Check this Padded Leather Dog Harness for safe Agitation, Protection, Attack Training and Walking! 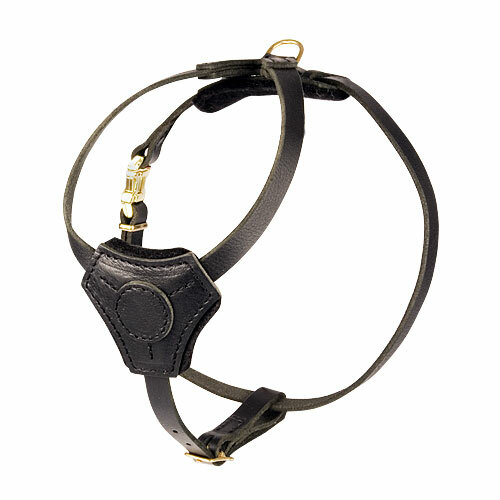 Adjustable leather straps provide comfy fit and doesn't restrict pet's movements. 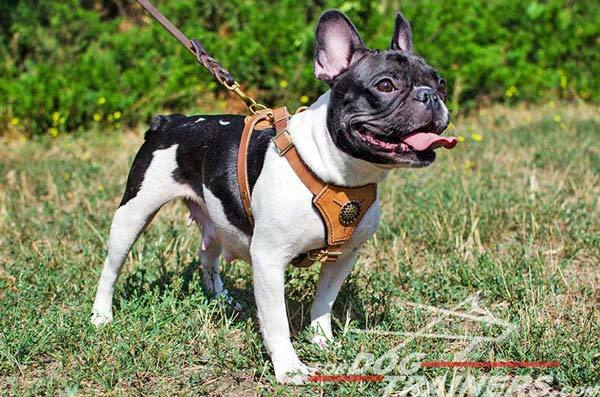 Order this Designer Leather Dog Harness with Spiked Padded Chest Plate.This walking and traning harness will make your pet's look cool and sparkling. Get now this Spiked Leather Dog Collar for Fashion Walking and Training. Luxury padded y shaped chest plate will protect your dog during training. Sparkling spikes will deliver dazzling effect on the walk. Purchase this Agitation Leather Dog Harness for safe wearing of your pet. Felt padded chest plate will protect your dog during attack training. Choose this Cool Handpainted Leather Dog Harness in American Flag style. This harness is great for Agitation/Protection/Attack Training and fashionable walking with your favourite pet. Pay attention to this Luxury Studded Leather Dog Harness for stylish daily wearing of your pet. It provides elegance, protection and safety every day. Get this Pyramids Studded Leather Dog Harness. The item works perfectly for walking in style and obedience training. Choose this Royal Studded Leather Dog Harness with exclusive decorations on the chest. Luxury padded, this harness is soft and comfortable. Your dog will enjoy its wearing. Purchase this Padded Leather Dog Harness for reliable agitation, protection and attack work with your pet. It protects the dog during heavy-duty training. Check this Padded Leather Dog Harness for Pulling and Tracking. It is front padded and has lightweight construction for better comfort of your pet. Order this Leather Dog Harness for Walking, Agitation and Protection Work handpainted in American Flag style. Your pet will get full protection and trendy outfit. Purchase this Work Leather Dog Harness for heavy duty traning and daily walking. The harness provides full protection of the dog's chest. Decorate you dog and buy this Spiked Leather Puppy Harness. This fashion accessory is a perfect choice for everyday activities. Which harness is the best for your beloved dog is always a challenging question. Most harnesses are created for different dog activities such as walking and training. They are equally dependable in wearing, so you can fully rely on this dog gear when controlling your pet. Having control over your dog on walks is essential for a handler. The right type of dog accessory takes the first place in this case. Leather dog training harnesses are a great tool thanks to the comfort they deliver the dog. Easy adjustment makes putting on/off easy and fast. It is highly important as there are many restless and lively pets who hate stand still long. There are hundreds of such harnesses available, many of them vary in style and function. With the wide variety to choose from, you can find the right fit for your favourite dog. 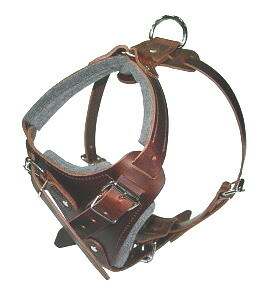 One leather harness helps to reduce pulling whereas another one was specially made for pulling. Attack/agitation training harness will be appropriate for heavy duty dog training. During training the handler should be sure in the reliability and durability of the dog`s equipment applied and has guarantee of dog’s health safety. FDT leather supplies provide safety and convenience in use. Wearing a harness is always an advantage. Dog harnesses are designed to allow your pet to push with the chest rather than the throat and a properly fitted harness removes pressure from your dog’s sensitive trachea by distributing the pressure more evenly around the dog’s body, therefore providing better comfort for your dog. This is why dog harnesses are recommended. Moreover, dog harnesses provide an escape-proof alternative to the traditional collar. The most important consideration when choosing a dog harness is comfort. A good fit can be reached through the correct dog measuring. You will need to measure your dog. There is a table ‘How to size your dog for this harness’ on each page for your convenience. Adjustable leather straps will help you to fit the gear tightly and reliably. Nevertheless, the tool doesn’t restricts pet’s movements allowing him to feel freedom being harnessed. Walking and training harness in most cases is y shaped. Such chest is padded with soft felt to reduce pressure and diminish pain or hit. But y shaped leather dog harness also fulfils a decorative function. Its chest can be adorned with studs or spikes made of brass or nickel plated material. Beautiful adornments are firmly riveted and will not fall away. Premium quality covering will not tarnish and stays in perfect condition for a long time. The hardware of each harness, D-ring, buckles and rivets, matches the decorations. Strong metal makes the fittings sturdy and almost unbreakable. Natural genuine leather is best choice for gentle care for your dog’s skin. Checked and tested for strength, durability and safety, this stuff is absolutely eco-friendly and hypoallergenic. Nothing will bother your dog when he/she is in one of these wonderful harnesses, make your order right now and let your pet be happy!